This is a totally new kind of a remake of the popular Xonix Jezzball game, download it to have a try now ! 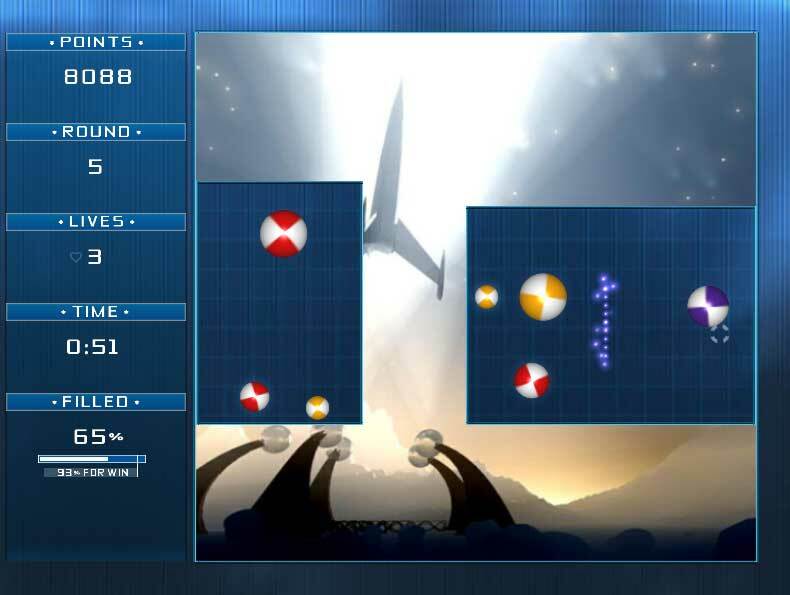 Jezzball Game - Jezzball Ultimate is a totally new kind of a remake of the popular Xonix game. Here is a new exciting game called Jezzball Ultimate. Try it and you will definitely fall in love with this exciting new game! In this version, you can use any pictures by creating your own themes. The aim of the game is very simple: at every level you will need to reveal the colorful picture without hitting the various moving balls. Even though the game might seem to be very easy, its fabulous gameplay makes it really addictive. Numerous difficulty levels will make this game interesting both for novices and pro players. You will also appreciate the excellent graphics, a great variety of special effects and ear-pleasing music, composed specially for this game. Non violent game for all ages and variety pictures. Electrobalz - Smash through over fifty levels in this awesome arcade game! El Airplane - It is a spoof on popular scrolling shooters game. you are to pilot the most unusual airplane in the world! Swipe - An addictive arcade game. Think smart - act fast! Tiny Cars 2 - This PC racing game is back with three car racing game modes including Multiplayer! Tamale Loco - Rumble in the Desert 2 for Windows is a super game for you, download tamale loco now! Fatman Adventures - Help! help Fat Man complete his treasure hunt adventure! Fatman Adventures game is just for you! QuadroNoid - The Magic Worlds is an absolutly new remake of popular arcade game Arkanoid (also known as BreakOut)! RotoBlox - A mixed collection of classic and newest tetris games! has different skins. 5star Game Copy Software:GameJack 5 - One of the best and truly unique, that is the 1:1 copy module in GameJack.